An edgy and romantic styled shoot in Cyprus, co-ordinated by Love4Weddings. Legend says Cyprus is the birthplace of the goddess of love, Aphrodite. The wedding styling is a mix of ancient magic and contemporary style. This edgy and romantic styled shoot in Cyprus will inspire you to be bold with your wedding style. Photographed by Antonis Georgiadis and co-ordinated by Eleni Balkouli from Love4Weddings, the styled shoot took place at the Columbia Resort, a stunning five-star resort in Cyprus. The wedding ceremony features a floral circle created from scratch with flowers including dusty miller and proteas. The super on-trend circular ceremony is set on a hill overlooking the sea – so romantic! The bridal fashion adds to the edgy and romantic look too! For a contemporary take on the classic ball gown, the wedding dress features fine vertical ruffles and a beaded belt. Cyprian designer Gregory Morfi says the movement of the waves inspired that exquisite silk tulle skirt. Paired with a black diamond engagement ring, the bridal style is beautifully unique. 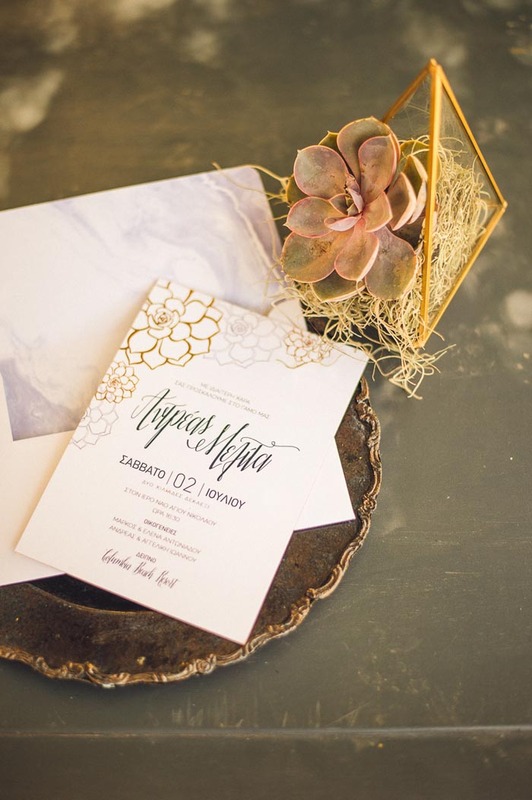 Wedding planner Artemis Aristidou and her talented team from Fresh Individual Creative Events designed the wedding with a combination of modern and rustic details. Contemporary Louis- style ghost chairs are contrasted against the natural wooden tables and lush floral designs. The rustic reception is decorated with an earthy colour palette and copper accents. The tables are finished with ultra chic succulents in terrariums, given as bomboniere to the guests. We love the sweet but subtle touch of Coldplay-themed lyrics throughout the styled shoot. It’s a great example of how you can bring in sentimental meaning to your wedding without being over-the-top cheesy. Coldplay lyrics are printed on the backs of chairs at the reception and written on a decorative scroll, hanging from a tree. A unique suggestion from Love4Weddings is to personalise the calligraphy inscription on the ghost chairs using words from your proposal. How sweet is that?